Bitcoin Cash hard fork update! Who's winning - BCH ABC or BCH SV? This week the crypto markets and communities have been facing the contentious hard fork of Bitcoin Cash that started Nov 15, 2018! For the first time since Bitcoin Cash (BCH/BCC) came into existence August 2017 (by means of a hard fork from Bitcoin BTC), the Bitcoin Cash community seems split between 2 different versions for the hard fork upgrade. And the battle between the community and top mining pools has become quite severe and threats of a hash war have been thrown around. Each side is determined to be the one and only Bitcoin Cash and acquire the ticker symbol BCH. The hard fork has passed by now, nodes have been upgraded, and as expected the chain has split into 2 new chains: Bitcoin Cash ABC and Bitcoin Cash SV (Satoshi’s Vision). Both chains are mining blocks and at some exchanges, coins of each chain can be traded. Is it all over now and what is happening with that hash war? First of all: if you want to read more about the historical background of Bitcoin Cash and how it came into existence, please read this article. For more information what a hard fork essentially is, please read this article. In this video Kevin gives you a short overview of the background of the internal debate that started a couple of months ago between the 2 sides within the Bitcoin Cash community on which upgrade to implement; the big battle was between ABC and SV. After months of discussions, no resolution seemed to be made. However, just shortly before the actual hard fork date, no one really knew what was going to happen at all. Early November, as the deadline approached, things started to heat up again and the divide became much clearer. The ABC side had Roger Ver from Bitcoin.com (service provider and mining pool operator), Jihan Wu of Bitmain (miner manufacturer and miner) and other miners like Btc.com. The SV side has Dr Craig Wright (“Fake Satoshi”) from nChain and miners of the likes of Coingeek, BMG Pool and SV Pool. Craig Wright threatened that their group (SV) had accumulated enough mining equipment to wage a hash war to destroy the ABC chain if it were activated. And that they would do so at a mining loss if needed. At that time nobody really believed it, as Dr. Wright had been bluffing in the past already (hence the name FAKE Satoshi). An additional threat was that after the ABC chain would be destroyed, they would form Sharkpool to go after other altcoins to also destroy those. However, close to the hard fork date it appeared that the SV group of miners against all previous expectations did manage to increase their hash power on BCH to up to 78% which gave them enough power to mine SV while simultaneously attacking ABC after the hard fork. As this was quite unexpected and nobody could exactly predict how this would play out, some FUD potentially crept into the market, contributing to the severe price drop just prior to the hard fork. What happened at the hard fork? Because of the anticipated uncertainty around this controversy, most exchanges had announced their positions, some explicitly favored ABC and wouldn’t support SV, others would support the trading of coins on both chains (and replace the original BCH pairs). Coinbase for instance, decided to stop all activity in BCH until it would become clear which chain would be deemed the real BCH. To clarify: according to Bitcoin consensus rules, after a hard fork with chain split, the chain that accumulates the most work, is officially recognized as the real chain. For that reason also, miners from both sides would aim to “accumulate the most work” with their hard fork implementation. Exchanges would decide to open deposits/withdrawals again AND which coin will ultimately become the “real” Bitcoin Cash (with the BCH ticker) when any of the chains proves to have the most accumulated work and seems stable. Also shortly before the time of the hard fork, Roger Ver announced that his Bitcoin.com mining pool would switch hash power allocated to mining Bitcoin BTC towards mining Bitcoin Cash ABC. And indeed hashing power was moving from BTC to BCH like half hour before the hard fork time. Less hash power on BTC also means a slightly less secure BTC network. All of a sudden the ABC side had tremendous hash power and after the hard fork, they were able to mine the first block. Bitcoin.com controls about 60% or more of the hashing power on the ABC chain (far more than the 51% needed to maliciously attack a blockchain network). Meanwhile Coinbase had stopped trading BCH entirely (and still hasn’t resumed at the time of writing) and Kraken continued BCH trading regardless, but supports the ABC chain only for the time being. Poloniex, Bitfinex, Binance and others had dropped the BCH pairs altogether and replaced them with coins of both chains. Prices for both chains have been fluctuating a lot and differences between exchanges can also be considerable since arbitrage is impossible with no exchanges allowing deposits and withdrawals. After a while, because of the dominance created by the hash power of Bitcoin.com, ABC was able to create a blockchain with much more accumulated work. However, since Bitcoin.com is essentially “borrowing” hashing power that is supposed to be dedicated to Bitcoin BTC (which is expected to be switched back eventually), the SV chain could start to catch up again in the future. Besides that, apparently the SV chain has not been mining with the amount of hash power that was assumed to be available to them. Some people are questioning where that hash power is being utilized – some even considering that the SV group is “shadow mining” on the ABC chain (meaning that they produce blocks on that chain without broadcasting to the network). At any point in time, if they are longer than the current chain, they could broadcast their version, making the consensus algorithm reject the initial version and replace it by the shadow mined one (although that is still being seen as theoretical). Nevertheless it appears that developers on the ABC side have chosen to not take the risk and are deploying something called a “checkpoint”, which is technically a centralized solution to prevent at certain points in the blockchain that blocks can be replaced by a shadow mined longer chain. Some have criticized the ABC developers for applying this centralized tactic, even though allegedly this method has been deployed on Bitcoin BTC in the past by Satoshi Nakamoto himself. So even though it appears on “paper” that the ABC implementation seems to be the longest and strongest chain for the time being and therefore the most likely to become the official Bitcoin Cash BCH, it seems that the battle is not over yet and surprises may still occur. For now at least both chains are surviving independently and both are being valued on the crypto markets. ABC has been as low as almost $200 and since the fork as high as almost $350, at the time of writing around $267. SV has been as high as almost $244 prior to the hard fork and dropped afterwards to a low of less than $71, followed by a choppy increase to around $120. Interestingly enough, because the ABC and SV miners are currently willing to mine at a loss on their respective chains for ideological reasons, and a lot of their hash power has switched from BTC to Bitcoin Cash (ABC and SV), mining Bitcoin BTC is now more than 100% more profitable than mining Bitcoin Cash. What is notable is that both chains are being mined by no more than 5 mining pools on each side, so both chains are therefore extremely centralized currently. Bitcoin.com dominates ABC with more than 60% of hash power. 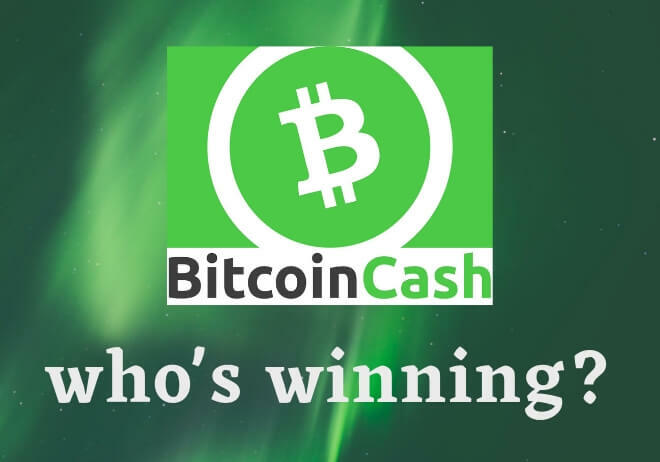 It is still too soon to say which side has “won” the battle, who is the new “real” Bitcoin Cash and if either chain may get attacked by the other side. There is no replay protection on either chain, which means that if you transact your coins on 1 chain, it may be possible that the same transaction is repeated on the other chain by a malicious actor. Please be absolutely sure that you know what you are doing if you try to transact on either chain or try to split your coins. If it is avoidable, try to wait until the dust has really settled and transaction procedures are clear and safe. Considering the uncertainty and confusion, please understand that scammers and phishers are almost certain to try to exploit the situation. Do not do anything that you are not 100% confident about that it won’t compromise the security of your funds/keys. This whole Bitcoin Cash hard fork debacle from entertainment perspective is quite exciting to follow, because of all the drama and plot twists. However for investors with a lot of money invested in BCH it may create a lot of uncertainty if they are not careful, which would not be positive. Also from an outside perspective, this whole drama doesn’t give the crypto industry a particular good and trustworthy reputation, which can hurt mass adoption. The main promise of Bitcoin Cash of being this wonderful digital cash for consumers and users, its reputation is being harmed significantly because of all the uncertainty and confusion. Not to mention that surrounding the fork, it was practically unusable. The lesson that the BCH community probably has learned this time, after being very pro-hard forks, is that they are maybe not such a great method to utilize often in the future. Also from a game theory perspective, it is also interesting to follow how this plays out, because in short we can learn lessons that we can take into consideration to avoid such circumstances for other cryptocurrencies. Hopefully we will get much more clarity as soon as possible on the end result of this hard fork, but for the time being we will be forced to wait and see. Be careful out there with your Bitcoin Cash – make sure that you know what you are doing if you try to transact with it. Do your own research and double check everything!